Born from the hit TV shows of the same name, Animal Planet toys aim to engage children with a large range of animals that they may have seen on their screens at home. Generally focussed on products for the 3 to 8 years old age group, these toys capture the finer details of animal’s postures, coats and expressions that are lacking in other similar figurines. By adding accessories to some of their sets, Animal Planet helps to capture kid’s imaginations and help them engage on what any particular animal might be like in the wild. The Deep Sea Shark set is a great example. Not only does it include scale models of Great White and Tiger sharks, but adds in a realistic divers cage complete with scuba diver. The Great White’s ferocious jaws also open and close! Apart from real world creatures, Animal Planet also creates mythological versions as well as a series of dinosaurs based on the latest research into these extraordinary beasts. 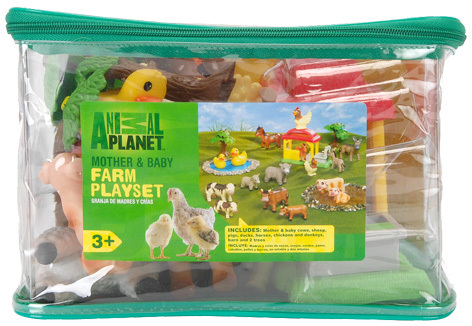 Other toys include jigsaws, soft toys, dressing up outfits and stickers featuring all the favourite animals.